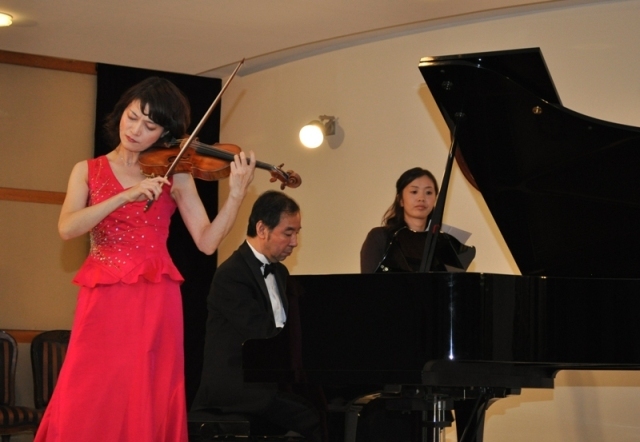 The delightful dialogue between piano and violin, presented by the Japanese artistes, filled the air with such warmth, grace, and amiability that it simply charmed the audiences. The brilliant musical performance, held here at the auditorium of the Turkish Embassy on Tuesday evening, was attended by a houseful of music lovers, mostly foreigners. The Embassy of Japan in collaboration with the Turkish Embassy organised the joint music recital to celebrate the 60th anniversary of the establishment of the diplomatic relations between Pakistan and Japan. The sweet sounds of piano and violin tunes were played by four celebrated Japanese musicians, Mr. Kazuhisa Akita (Composer), Mr. On Mitani (Pianist), Ms. Mie Kobayashi (Violinist) and Ms. Yuriko Ito (Pianist), together with the Japanese Ambassador Hiroshi Oe, who surprised many in the audiences by playing some charming melodies. The musicians performed lovely works by Mozart, Beethoven, F. Chopin, R. Schumann, V. Monti, and P. Sarasate. The works were presented with an edge that the playing kept both the music and the audience on their toes, and even the familiar works as Beethoven’s Spring Sonata and ‘Turkish March’ by Mozart produced surprises. Hiroshi Oe started to play the piano at the age of 5, and after a long interlude of 30 years, resumed taking lessons again from 2006. He won 2 Gold medals and 2 Silver medals in the Amateur solo and concerto sectors of 2011 International Chopin Competition in Asia. He has played with Tokyo New City Orchestra, as well as the Prima Vista Quartet and the Silesia Philharmonic Orchestra from Poland during their visits to Japan. He also gave a fundraiser concert at the University of Tokyo in 2011 after the earthquake and tsunami. Ms. Yuriko Ito, who graduated from the Toho Gakuen College of Drama and Music in Japan and Moscow P.I. Tchaikovsky Conservatory, has won many prizes at international piano competitions including the first prize at the 5th Great Wall International Piano Competition. She is now Vice director of the Association for Promotion of the Arts. Ms. Mie Kobayashi, one of Japan’s leading violinists, was the first Japanese artist to win first prize at the Marguerite Long-Jacques Thibaud International Competition for Piano and Violin in 1990. She studied at Tokyo National University of Fine Arts and Music. Kobayashi is currently a professor at Showa University of Music. Mr. Kazuhisa, who won the first prize in the 6th ‘Valentino Bucchi’ International Composition Competition (Italy), has also received prestigious awards at several competitions such as ‘Hambacher Preis’ International Composition Competition (Germany) and the 42nd & 44th Music Competition of Japan. Currently he is a professor at Showa University of Music. Mr. On Mitani, graduated from the Toho Gakuen School of Music. He has played solo and chamber music in different parts of the world. He was appointed as “Special Advisor for Cultural Exchange” by the Agency for Cultural Affairs, Government of Japan in 2003.